Of the thousands of migrating waterbirds funnelling down the Columbia valley enroute to their wintering grounds, the most spectacular are two species of swans. They are easy to pick out with their white behinds pointing to the sky as they feed in the ponds by the Revelstoke airport. Tundra Swans are the more common species, distinguished by a yellow patch at the upper end of their bill, a feature discernable only with quality binoculars or a spotting scope. The slightly larger Trumpeter Swan, with a two meter wingspan, is the largest and rarest swan in the world. The only way to distinguish them at a distance is by their voices: Tundra Swans have a high note / low note woo-ho call; while Trumpeter Swans honk like a toy trumpet. Hunted to near extinction in the 1930s, Trumpeter Swan numbers rebounded once Canadian and American wildlife agencies eliminated hunting and protected their nesting and wintering sites. Trumpeter Swan populations remain vulnerable to the loss of wintering grounds, but are still considered one of the great success stories in North American conservation. Prior to European settlement at the end of the 19th century, the area south of Revelstoke was a mosaic of sloughs, willows, cottonwood, and cedar trees. Farms replaced this riparian forest and in turn, were displaced by the Arrow Lakes Reservoir in 1968 with the completion of the Keenleyside Dam near Castlegar. The area by the airport is the best remaining fragment of habitat in the three reservoirs on the Canadian portion of the Columbia River. Up to fifty swans at a time have been seen there this fall. Their long necks and strong bills allow them to reach deep into the ponds to pull up roots and stems that other birds can not reach, eating up to nine kilograms of aquatic plants, insects, and snails per day. 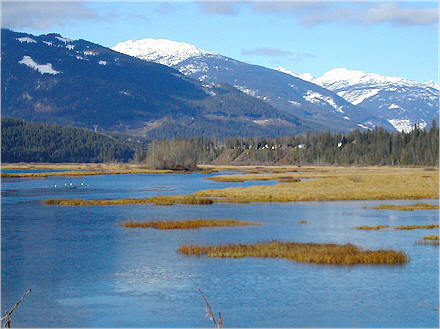 The Revelstoke wetlands offer the only feeding opportunity along 400 kilometers of otherwise foodless Columbia River reservoirs. While the swans are the most conspicuous bird at the airport wetlands, the most numerous are the Canada Goose, Mallard, American Wigeon, and American Coot. In all, 65 species use this area. Revelstoke birder Janis Jarvis, over a period of ten years, surveyed the northerly twelve kilometers of the Arrow Lakes Reservoir. As a volunteer, she conducted surveys twice per month, identifying 135,272 individual waterbirds— a term that includes waterfowl and other water dependent species such as gulls, herons, osprey, and eagles. She demonstrated that no other area within the Canadian impoundment areas of the Columbia River attracts such an abundance and diversity of waterbirds. Janis was supported by a few friends who assisted her in recording data, and by the Friends of Mount Revelstoke and Glacier who provided gas money. The fragment of wetland that remains at the airport is partially the result of the excavation needed to build the airport runway. While local pilots respect their fellow fliers, they consider them a potential hazard. So far, the planes and the birds have managed to coexist. Coincidentally, the Flying Club’s clubhouse is the best place to view the avian comings and goings from airport wetlands. The club permits bird watchers to use their site and it is where I had the opportunity to learn to distinguish between the two species of swans.